Free*Style: The evil twins do Free*style? The evil twins do Free*style? [18:31] scrim Pinion: you two is done up like a couple cupcakes. 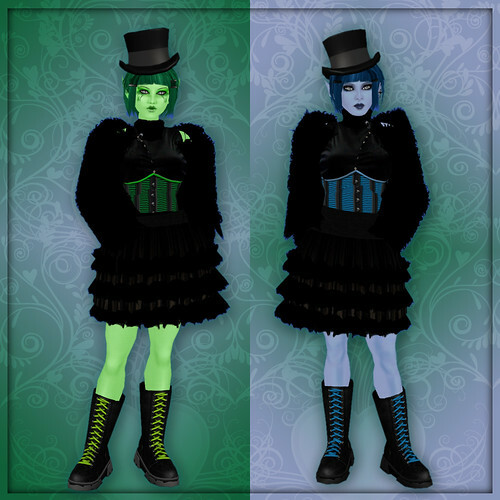 Mourna and I set ourselves a goal for this set of eeevil twin pictures (more of these are over here at my blog). "Let's try for an outfit of freebies," I suggested. We did pretty well -- the expensive items are the boots for 40L from House of Curios, but they're dirt cheap for a color-changing pair o' boots. I admit that I was inspired for this post by the 0L Nyanotech hair from Curious Kitties. If you have the hud, the 0L hair is completely color-changing; I bought the 700L hud (35 colors!) and the four 0L hairs, and instantly had four hairs of 35 colors each for 700L, more or less. The hud works on the rest of the Nyanotech hair too, so it's well worth a splurge. 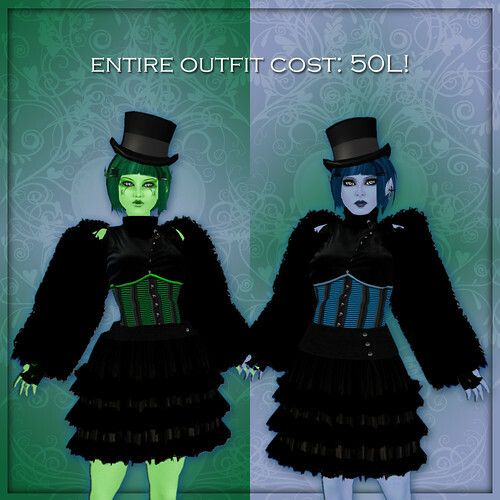 The green corset happened when I bugged Terry to tell me where I could find two cheap vaguely gothy dresses in different colors. "Oh -- Dilly Dolls," she said, and she was right. We poked about on XStreet for the skirt and shirt under that, and the fur coat was a happy find at Curio Obscura while I was picking up the hat. (Note: there are 'steampunk stockings' there too for free; turn your legs into an animatron's!) 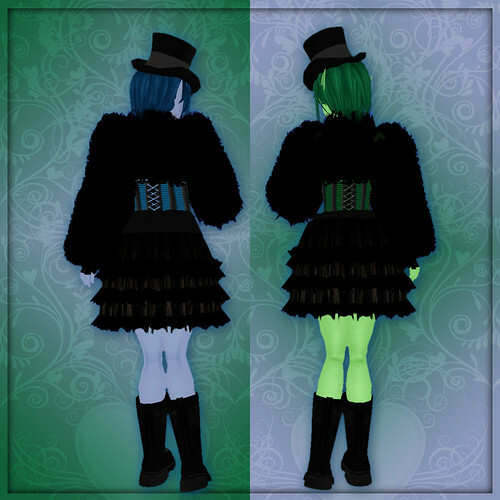 The skins don't match exactly, but they're from Frick and amazing for 0L / 5L each. Happy bargain hunting, and check out the beautiful Mourna at her blog over here. I love your evil twin posts and a cheapie one at that. You two rock!